From their home in Salem, Oregon, Ken and Judi Bennett have a long history of volunteering for causes they believe in. 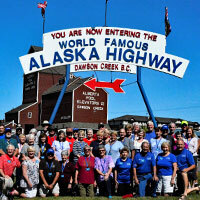 Today, they’ve combined that unselfish outlook with their work for Fantasy RV Tours. Ken has a military background in the U.S. Navy and in the Army National Guard, and later worked in the printing business. When he retired 13 years ago, he volunteered for the Oregon State Parks, working for them for seven years. Judi was still working as a Certified Medical Assistant but later joined him for the last four years of his volunteer work. Together, they gardened, planted trees, cleaned campsites and did so much more to help make the Oregon State Park system so appealing. The Bennett’s also have had a rich history of RVing – starting in a tent when their first son was just 18 months old. “We decided really quickly we didn’t want to tent,” says Judi. They progressed to a camper, a travel trailer, a 5th wheel and then a motorhome. Today they drive a National Pacifica 40’ diesel pusher motorcoach and travel with their miniature Doberman pinscher – “12 lb. of spoiled rotten,” they say. 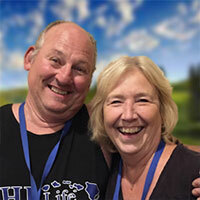 Ken and Judi first learned about Fantasy Tours on their annual winter stay in Palm Springs. “Fantasy was doing presentations at our campground,” says Ken. “We signed up for the Grand East Coast caravan, then attended the Albuquerque Balloon Fiesta followed by the Rose Parade Rally.” After these experiences, they decided that they were interested in working for Fantasy, and have been doing so for the past three years. They’ve been busy during those three years. They’ve been to Alaska twice, worked the Albuquerque Balloon Fiesta twice, the Rose Parade Rally two times, and were TailGunners this year on the Rocky Mountain National Parks of the North tour. Judi considers their first trip with Fantasy – the Grand East Coast Tour – as her favorite. “Visiting the East Coast with Fantasy made it so easy. We would never have done it – to have it all planned for you was great,” she says. Ken has a different favorite – the Rocky Mountain National Parks Tour. “I just prefer anything other than skyscrapers,” he says. At home in Salem, Ken and Judi enjoy time with their family – two sons and a daughter. They also have five grandchildren and their first great grandson was born in September. “We love doing this. We’re living our dream,” they say.